This series, will explore how winner-takes-most or winner-takes-all applies to the cryptocurrency market. 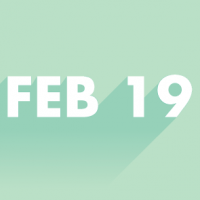 In Part I, we will discuss the evolution of monetary systems, including cryptocurrencies, with a focus on the limitations of previous forms of money. In Part II, we will explain why the clear winner, likely bitcoin, should capture most, if not all, market share in the cryptocurrency space. In Part III, we will analyze what share of the global monetary base cryptocurrencies could capture. As the limitations of these early forms of money began to manifest, new forms emerged that served as much better stores of value and mediums of exchange, thanks to their scarcity, durability, portability, fungibility, verifiability, divisibility, and established history. Through a process of natural selection, these monies competed with each other for dominance and, in the nineteenth century, gold evolved as the global monetary standard. Following gold, other commodity monies took shape. Silver was particularly popular because transactions costs, including friction, were much lower than those for gold in day-to-day trade. Silver’s lower value per unit weight facilitated smaller transactions better than did gold.2 For centuries, the gold-to-silver ratio ranged between 12 and 15 and evolved into the bimetallic standard. The bimetallic standard was temporary, a stopgap measure until information systems and technology enabled paper money backed by gold. 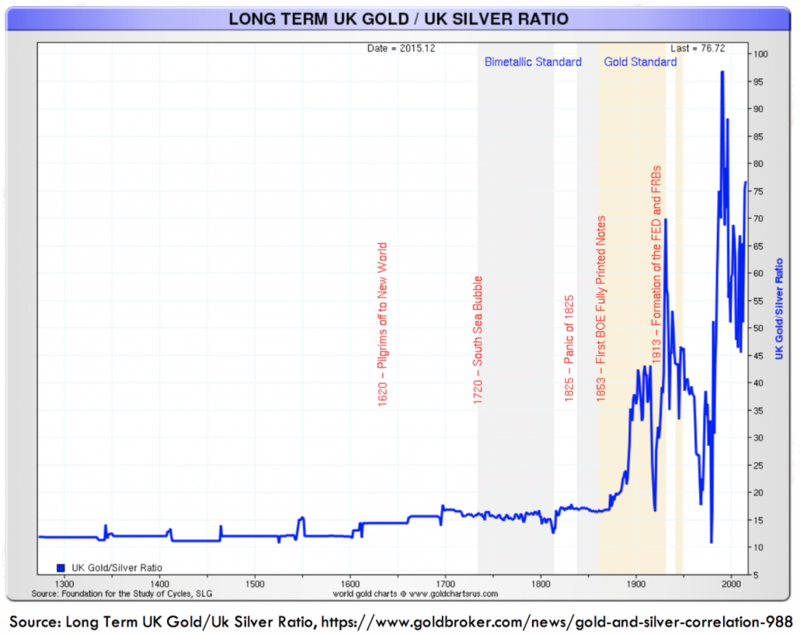 When trade of any value could take place with paper money in terms of gold, silver lost its standing in the monetary system and, as shown in the chart below, the gold-to-silver ratio soared from 15 to 70. In other words, silver lost nearly 75% of its value in terms of gold. With time, gold’s limitations as a global money began to surface. Because of its bulk and high value per unit weight, gold was vulnerable to the human intervention associated with centralization. Because each transaction required gold bars as well as scales and measures, jurisdictions began to standardize units by minting -coining – gold coins which devolved into ‘coin clipping’, debasing the currency and destroying purchasing power. In time, goldsmiths became “custodians” of precious metals and introduced promissory notes (IOUs), paper money used in exchange for goods and services. The goldsmiths learned that they could lend out more notes than the gold in their vaults would support because redemptions did not take place simultaneously. Enabling the precursor to the fractional reserve banking systems in place today, goldsmiths formed bank-like entities, issued notes well in excess of their vaulted metal, and generated massive profits. Given silver’s fall from monetary grace and the proliferation of bank notes, governments evolved toward the Gold Standard during the eighteenth and nineteenth centuries, formalizing it in 1900. To adhere to the Gold Standard, a country linked its money supply directly to the value of its gold reserves, capping its ability to inflate it. In the twentieth century, however, countries began testing the limits of their fractional reserve banking systems, throwing into question the viability of the Gold Standard as a governor on monetary policy. The US centralized gold reserves, sometimes confiscating privately held gold,3 and lost all discipline as it printed money in excess of its underlying reserves, until President Richard Nixon cancelled the convertibility of the dollar into gold and abandoned the Gold Exchange Standard in 1971. With the link between gold and paper money severed, monetary authorities had the freedom to issue fiat currencies backed by nothing but promises. 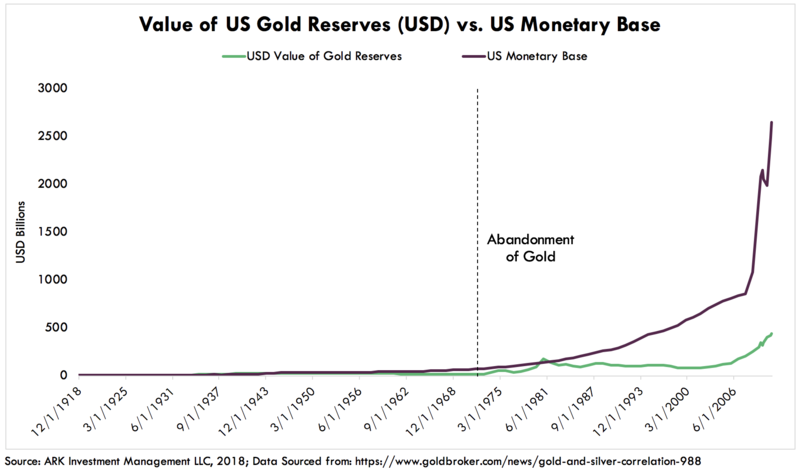 Below is a chart of the US monetary base expansion relative to the value of US gold reserves. Today, more than 180 currencies span across 195 countries, highlighting the absence of a free market. Governments have restricted currency markets to maintain financial control, with laws and institutions inhibiting free market monetary systems. Among the restrictions are borders, legal tender laws, capital controls, state decrees, seigniorage privileges, local control, local monopolies on violence, debt extinguishing laws, capital gains taxes, implicit bailout guarantees for banks, central banks and dozens of other artificial barriers that defend inferior currencies. Citizens of countries like Venezuela are unable to protect their wealth from the hyperinflation caused by irresponsible monetary policies and capital controls. They also have to accept the inferior currency in exchange for goods and services, as more stable currencies like the dollar sell at significant premiums. Until recently, they have had no way to opt out of this system. In 2008, Satoshi Nakamoto proposed Bitcoin, a financial system free from top-down control. Bitcoin, “a system for electronic transactions without relying on trust”, was not created to fit into existing government and financial systems. 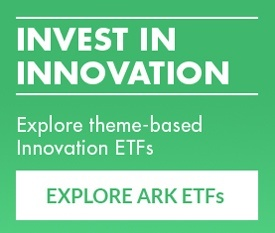 Bitcoin is the experiment that allows experimentation. Unlike any other money, bitcoin is borderless, permissionless, censorship-resistant, and verifiable. In other words, bitcoin could be the “sly roundabout way” that bypasses prohibitive mechanisms and legacy financial institutions that restrict access to money. Often called digital gold, bitcoin is scarce and unforgeable. Given its digital nature, bitcoin is divisible, portable and unseizable and, unlike gold, able to withstand threats of centralization. 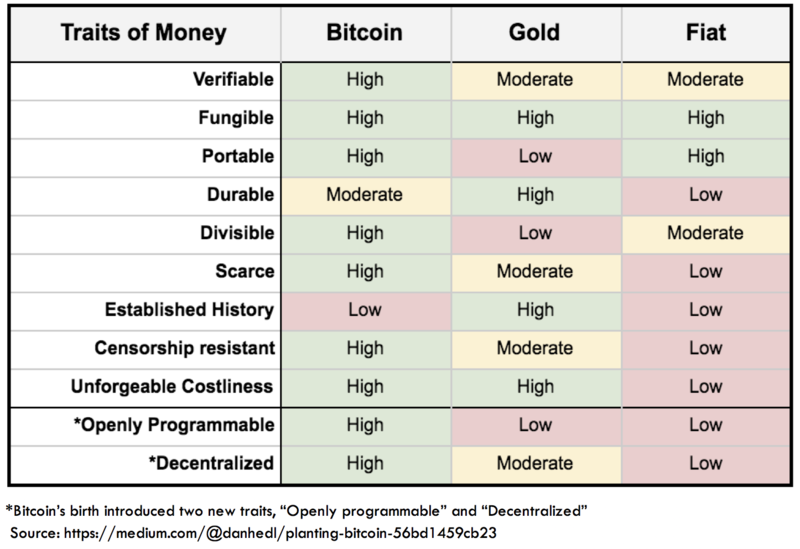 Introduced by Vijay Boyapati and augmented by Dan Held, the table below assesses bitcoin, gold, and fiat as they attempt to play the various roles of money. Cryptocurrencies are money. With the exception of a few, ‘crypto-tokens’ are either money or money obfuscated by technological jargon. As bitcoin evolved and appreciated, other cryptocurrencies – or altcoins – flooded the market, many of them iterating upon its “fundamental design flaws” and “limited functionality”. Ten years after bitcoin’s inception, for better or worse, 2,000 cryptocurrencieshave joined the movement. In the last century, gold gave the markets a glimpse of winner-take-most, if not all, as a store of value, a model perhaps for cryptocurrencies. The question this time is how permanent a phenomenon it will be. 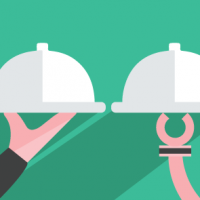 In Part II, we will explore the validity of a winner-takes-all narrative. By defining market size as the monetary premium of all cryptocurrencies, we hope to shed light on the merits of such a narrative.